Display up to 448 mini king cones of UltraBrite™ polyester thread by Iris® at once, in this premium, dark wood-look free-standing wall display. This thread display package comes complete with all necessary hardware, and 400 mini king cones of UltraBrite™ polyester thread. UltraBrite™ polyester thread by Iris® is size 40 genuine American Trilobal polyester and has the best recovery and elongation stability. These brilliantly colored threads are ideal for machine embroidery and quilting. 4 each of our best 100 colors are included. 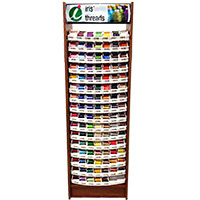 Thread color assortment is based on the popularity of the colors. UltraBrite™ polyester mini king cones are 1100 yd each. Instructions and thread placement planogram are provided.